Hidden Springs Resort cabin rentals are the closest Dollywood area resort cabins. Located directly behind Dollywood and Dollywood's Splash Country, you can access both parks in less than 5 minutes while still enjoying the scenic views several of the resort rental cabins offer! Many of our guest visiting Pigeon Forge and Dollywood enjoy the year round indoor pool access at Hidden Springs Resort. This is a large glass domed structure that invites the Smoky Mountain outdoors inside. Your large group or family can spend hours having fun in an indoor pool this grand in size. 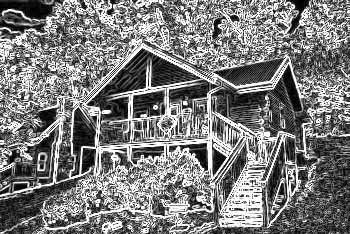 Cabins USA offers several 1 to 8 Bedroom Cabin Rentals in Hidden Springs Resort perfect for large church groups, family reunions or traveling retirement groups. If you need assistance grouping multiple cabin rentals together for your group vacation, please be sure and speak with our cabin rental reservationists who would be more than glad to assist you. Receive immediate SAVINGS when you BOOK your Hidden Springs Resort cabin rental Pigeon Forge ONLINE with Cabins USA!